LITTLE BUG, BIG PROBLEMS: An Asian citrus psyllid can carry the deadly disease Huanglongbing, which has already killed nearly 50 percent of citrus groves in Florida. One tiny bug recently found on a sticky paper trap hanging from a lemon tree in Falcon Ridge Estates in Arroyo Grande has caused a big stir. The Asian citrus psyllid, a little pest no bigger than the ubiquitous aphid, has become infamous among citrus growers in North America as it threatens to spread the infectious Huanglongbing, or citrus greening disease, to the trees it infects. The March 26 discovery has county and state agricultural officials and the citrus industry on guard and already mobilizing to fight the insect, said Martin Settevendemie, county agriculture commissioner/sealer. They’ve established a quarantine zone with a roughly 5-mile radius, covering approximately 9 square miles from which citrus material won’t be allowed to move in or out, as the county begins to go into search-and-destroy mode. While only one tree infected with Huanglongbing has been discovered in the state—in Los Angeles in 2012—and a few suspected carriers removed and destroyed, the presence of the psyllid poses a serious enough risk for government agents, researchers, and agriculturists to take great measures to stop the disease in its tracks. “If you don’t have a vector like a psyllid, no big deal, but when you have a vector alive and moving around, then you have a big problem,” said Dr. Beth Grafton-Cardwell, an integrated pest management specialist and research entomologist based in the San Joaquin Valley and working for UC Riverside’s Center for Invasive Species Research. Grafton-Cardwell has been working in one of many areas combating the psyllid. It takes nine months for a tree to demonstrate symptoms of Huanglongbing, and once it does, the leaves turn a brownish-green and the fruit grows misshapen and sour. Eventually, the disease kills the tree. So what’s the big deal? In the last 10 years, the disease has wreaked havoc on the Florida citrus industry, killing nearly 50 percent of the commercial groves and counting, leaving what the University of Florida estimated as $1.3 billion in losses so far and 6,600 lost jobs in its wake. Since the psyllid was first discovered in 2008 in San Diego and Imperial Counties, California officials have taken measures to contain it and stem the dangers of Huanglongbing. As the psyllid has spread, so has the fight against it. Now, San Luis Obispo County is engaged, hoping to protect the local citrus industry, which covers roughly 3,000 acres and is a $13 million industry. LEARN ABOUT THE BUG: For more information, go to californiacitrusthreat.org or contact the local University of California Cooperative Extension’s Master Gardener Program at 781-5939 for help in identification of unusual plant symptoms or pests. 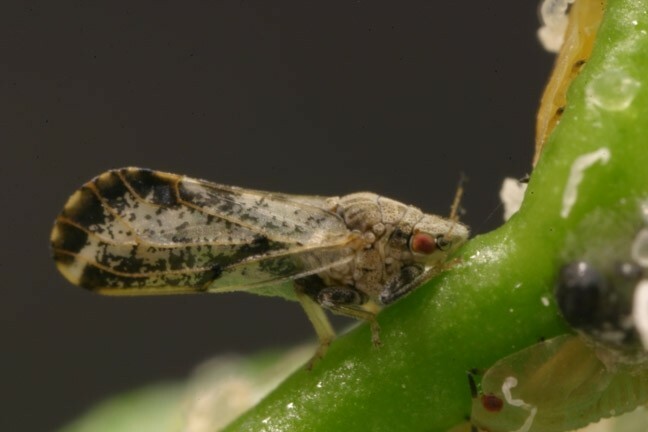 That the psyllid has arrived in San Luis Obispo County isn’t exactly a surprise, as it was first discovered in Santa Maria in November 2012; for those in the know here, it was only a matter of time. The primary areas where the eradication efforts are focused can change from region to region. In Los Angeles, the pest thrived in the urban area because of the residential density and the bouquet of foliage in those areas. In the San Joaquin Valley, the pest is more often found in commercial orchards because of their prevalence there and the relatively low density of residential housing. In San Luis Obispo County, the main focus now is on residential areas, Settevendemie said, because the widespread placement of citrus trees and the high volume of foliage that moves in and out of the area is what makes the pest’s presence a significant threat. Landscape maintenance and more frequent vehicle circulation are just some of the things that can move the pest around. For now, the concern isn’t directed so much toward commercial operations, which are generally more contained and well-equipped to follow certain guidelines. Because citrus trees in residential areas are scattered so sporadically, and not everyone with a backyard orange tree may be cooperative, it’s difficult to cast a foolproof net across a target area, though officials are still trying to get a jump on the pest. Even for those on the lookout, the pest’s size doesn’t help.